Do you still need a balanced fund? 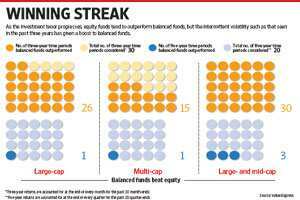 Amid news of a slowdown in inflows that appears to have plagued the Indian mutual funds (MF) industry, there’s one category in the equity space that seems to have consistently attracted money. In each of the past 12 months, balanced funds got net inflows (more money came in than went out) as per the data given by Association of Mutual Funds in India. These are hybrid funds that invest at least 65% in equities and the rest in debt. Most of the fund houses have a balanced fund each as there’s not much innovation possible in this space. Any more equity allocation would put it on a par with an equity fund. Any less equity exposure would remove its equity edge and unitholders can get taxed on a par with debt funds. But that doesn’t mean that all balanced funds are the same. The trick for a balanced fund is that the average of the month-end equity exposure for the 12 month-ends of the year has to be at least 65% for it to be recognized as an equity fund. Fund managers are free to alter their asset allocation depending on their view of the markets, but this average must converge by the end of the year. While some schemes such as HDFC Prudence (HPF) have consistently held about 72% in equities, others such as Franklin Templeton India Balanced Fund prefer to hold about 67% in equities. “If we go with a time horizon of two-three years, we believe that good stories are available in the equity market at present valuations. Hence, it makes sense to allocate that much to equities," says Prashant Jain, chief investment officer, HDFC Asset Management Co. (AMC) Ltd, who has been managing HPF since its inception in February 1994. On the other hand, Birla Sun Life 95’s equity exposure went up to 77% as on November 2007-end when equity markets were rising and down to 55% a year later after global markets fell, as per data provided by Value Research, an MF tracking firm. The kind of stocks they hold also differentiates one’s strategy from the other. For instance, DSP BlackRock Balanced Fund (DBF) prefers to split its equities between large-cap companies and small- and medium-sized companies, but ICICI Prudential Balanced Fund has historically preferred to invest 60-70% in large-cap scrips, though it has increased its exposure to small-cap companies significantly so far this year. Says Dhruva Raj Chatterji, senior research analyst, Morningstar India, an MF tracking firm: “Since balanced funds have high exposure to debt, many prefer to invest in mid- and small-cap companies." It’s possible that your balanced fund loosely resembles one of the equity funds from within the same fund house. Though there’s a vast difference in the strategy between a balanced fund and, say, a large-cap scheme within the same fund house, many fund houses model the equity portion of their balanced fund on the lines of one of their equity schemes. For instance, HPF is modelled on the lines of HDFC Equity Fund, one of the fund house’s long-running and successful equity schemes that invests about 75% in large-cap scrips and the rest in mid- and small-cap companies. DBF is modelled on the lines of DSP BlackRock Equity Fund, an equity fund that invests about 50% in large-cap scrips and the rest in mid- and small-caps. “It makes sense to split the investments between large- and mid-cap companies if you invest in equities at these times for two-three years. A pure large-cap fund may not necessarily outperform," says Ajit Menon, head (sales), DSP BlackRock Investment Managers Ltd. The gap between balanced funds and equity funds narrowed in 2006. Though balanced funds have been around for many years, the 2006 Budget mandated that all equity-oriented MF schemes had to invest at least 65% in equities to be eligible for income-tax exemption of long-term capital gains tax. Long-term capital gains tax is nil in case you sell your equity funds after a year. Until then, balanced funds used to follow the income-tax definition of equity-oriented MFs, whereby any MF that invested more than 50% in equities would qualify for long-term capital gains exemption. When Budget 2006 scrapped this definition and retained the one that the Securities and Exchange Board of India had given, almost all balanced funds increased their equity allocation to 65% or more. It won’t surprise us if your financial planner tells you to avoid balanced fund and instead directs you towards a low volatile, large-cap equity fund if you wish to start investing in equity markets for the first time. Menon believes that some large banks that have wealth management divisions that cater to high networth individuals do not usually suggest balanced funds because they feel that it’s their job to suggest asset allocation to investors. Sachin Jain, research analyst, ICICI Securities Ltd, says that they don’t aggressively recommend balanced funds, though they are a part of their recommendation list. “Balanced funds may have outperformed equity funds in the past three-four years, but that’s because equities have underperformed. It’s not because balanced funds are managed better," he says. A restriction to move their equity exposures up or down significantly, just to be able to retain their equity edge, “further reduces their flexibility and therefore their luster", he adds. Still, apart from fund houses, many financial planners still swear by them. Says Trideep Choudhary, head, research products and services, ICRA Online Ltd: “Even a low-volatile fund like a large-cap fund gets exposed to 100% equities. A balanced fund will not fully invest in equities, hence it caters to a medium-risk profile investor." Menon adds that his fund house has been “aggressively recommending balanced funds to investors these days". with equity markets down by 25%, earlier this month, from its 52-week high, financial planners are nudging their investors to invest in equities. Further, debt market experts feel that interest rates are close to their peak and may start falling sooner than later. A falling interest rate regime spells good news for the debt portion of a balanced fund, many of whose average maturities are around a year or two. “It’s a rare occasion where you stand a chance to kill two birds with one stone," adds Menon. Here’s what we suggest: if you wish to enter equity markets for the first time and are not comfortable with the stock market volatility, try your hand at a balanced fund; it’s well-poised.